CNBC created two sample portfolios, using ETFs that investors might use to trade different scenarios around the "fiscal cliff." The fiscal cliff is the hard hit to the economy that could result if Congress and the White House fail to act on about $500 billion in taxes and automatic spending cuts, that take effect starting Jan. 1. Hitting the cliff would likely bring on an immediate recession in the first quarter, and analysts saymarkets would immediately tradeas if there were a recession. That means stocks and other risk assets would be sold, and investors would flock to safe haven Treasurys, municipal bonds and the dollar. Stocks aren't yet pricing in a "cliff" event, but they are reacting to the idea of higher capital gains and dividend taxes, and the possibility that some elements of the cliff could occur. CNBC is not recommending any of the holdings in these model portfolios, and has assembled them merely as samples of sectors that may react, in consultation with market strategists. The stock market is down about five percent since election day, as investors worry about the cliff. 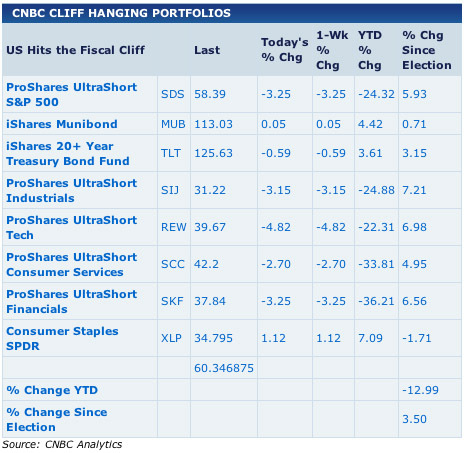 Since election day, the portfolio that includes investments someone might make if they think the U.S. hits the fiscal cliff is up about 3.5 percent but was down about 1.5 percent Monday, as optimism about a resoultion to the "cliff" pushed the stock market higher. That portfolio includes short positions in consumer discretionary stocks and long positions in ETFs for Treasurys and muni bonds. 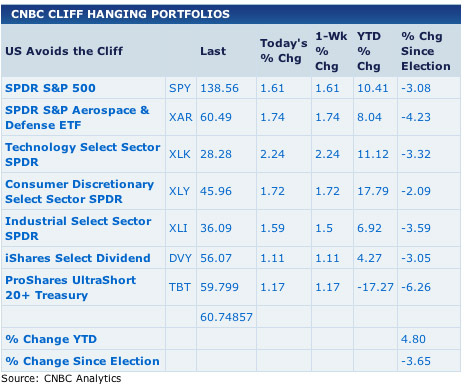 A portfolio someone might build if they think the U.S. will avoid the cliff, including ETFs that hold defense stocks, technology stocks and dividend paying stocks, declined by about 3.6 percent in that same period. It moved higher Monday, as stocks rallied.